My first assignment upon reporting aboard the PICTOR was Assistant Navigator, and this was more or less at my request because the subject interested me, and they didn’t have anywhere else to place me on short notice. Later, however, a new officer came aboard who was a direct transfer from the California Maritime Academy. He knew navigation, but was not really up to speed on things “Navy.” As a result, I was made Communications Officer and he became Navigator. There was no way I could avoid it, I had, after all, been formally trained for that position. 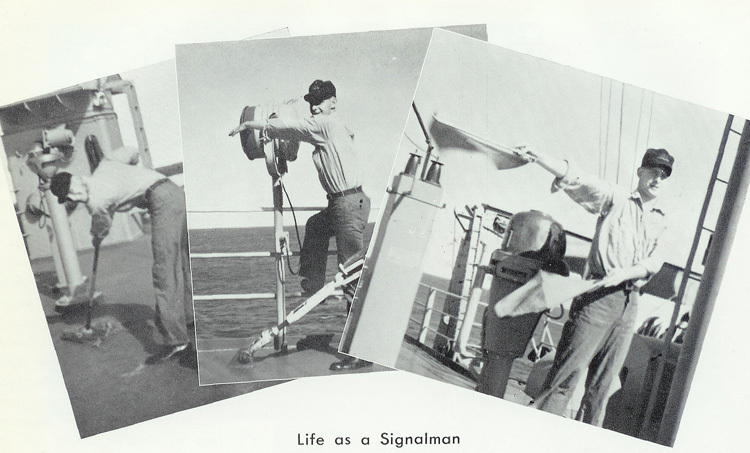 Being Communications Officer meant supervision of radiomen and signalmen. These were a good group of guys, smart and motivated, so not much supervision was required on my part. It also meant being in charge of encryption and decryption of classified communications, and that consumed the bulk of my time. Classified communications usually arrive designated either CONFIDENTIAL, SECRET, or TOP SECRET. Being as we were an auxiliary vessel and not a combat vessel there was hardly ever anything classified above SECRET. In addition, each message was also assigned a precedence dictating how quickly a message had to be processed. These were ROUTINE, PRIORITY and FLASH. Sometimes it was difficult to understand why certain communications were categorized as they were. For instance, if a message came in while I was in my bunk sound asleep, which was designated SECRET and PRIORITY it meant a radioman had to roust me out of my sleep to go and decrypt the message without delay. We actually received very few messages with this type of designation, but one that always came that way was the monthly WESTPAC Venereal Disease (VD) Report. This report ranked each of the usual Navy ports of call in the Western Pacific by the number of cases of VD per one thousand liberties. What was so SECRET about that? Why the PRIORITY precedence? After a while I would, upon discovering the nature of the report, shut down the decryption machine, go back to my bunk and finish the process at a decent hour in the morning. After I had been Communications Officer for a period time, the Executive Officer called me into his office to tell me I was being assigned the collateral duty of Classified Material Control Officer. I reminded him that I was only cleared up through SECRET and I knew that we had at least one TOP SECRET document aboard the PICTOR. “No problem,” he informed me. At the Captains discretion they were giving me an interim TOP SECRET clearance which would be specific to this command. He then gave me the combination to the TOP SECRET safe which was located in the crypto room and sent me off to my new responsibility. Well. . .okay. I went directly to the crypto room, opened the safe and took out a single envelope stamped, in big red letters, TOP SECRET. I remember reading this document and feeling as if I were privileged to some kind of holy of holies. The nature of this document was such that I can tell you its nature without divulging its secret. In fact, I have long ago forgotten the actual secret. Remember, this was circa 1963 and the cold war was in full swing. The secret was simply a longitude and latitude somewhere in the middle of the Pacific Ocean (I never bothered to plot it on a chart). This spot was to be a rendezvous where whatever was left of the U.S. Navy would assemble should WWIII break out, resulting in a full nuclear exchange between the USA and the USSR. It assumed that the only thing left of the Navy might be ships that happened to be at sea at the time of the war. How long would such a war last, an hour maybe, an hour and a half? At any rate this was where where the remainder was to gather, scratch their heads and try to decide what to do next. 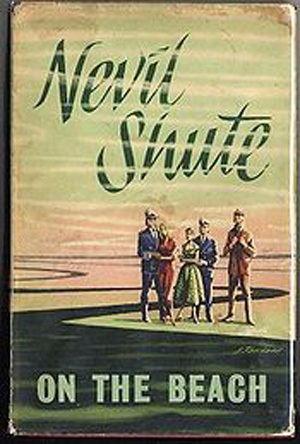 One is strongly reminded of the novel by Nevil Shute entitled On the Beach (1957). The story imagines a circumstance as described above. It was made into a movie with the same name (1959) starring Gregory Peck and Ava Gardener. The phrase “on the beach” is a long-standing naval expression used to describe the location of any crew member who has left the ship and gone ashore. I wonder if the book and movie in any way influenced the document I viewed in 1963. I threw on some clothes and stumbled up to the radio shack. I was greeted by the first class radioman. I went in, sat down in front of the teletype machine and started reading. Sure enough, the message began TOP SECRET, FLAG OFFICERS ONLY (Commodore or above). Whoa! I certainly wasn’t a flag officer, but I read the message any way. It wasn’t my mistake. As I was reading, the machine suddenly came to an abrupt halt! There was a pause, of perhaps a minute, and then it came to life with: DESTROY THIS MESSAGE IMMEDIATELY! or words to that effect. Apparently someone at the communications center had loaded a tape on the the wrong system and the mistake was caught in progress. These things all happened almost fifty years ago, and I sincerely doubt that they are of any signifigance today. One thing is for sure, WWIII hasn’t happened yet so I am still here and able write Uncle Rob’s Sea Stories.